Food Costs > How Much Does Spinach Cost? How Much Does Spinach Cost? Spinach, commonly used in salads or prepared with other dishes, grows to a short height of just around 11 inches and can typically survive the coldest of winters. Spinach originated in the central and southwestern regions of Asia, but it is now grown almost worldwide. While the spinach plant has flowers, they are not very noticeable and are formed in small clusters that contain many seeds. Loose baby, organic spinach is going to cost anywhere from $7 to $10 per 16-ounce batch. If sold by the pound, the costs can be closer to $7 to $10 per pound. On the other hand, a “bunch” of spinach, commonly found at the local grocery store or farmers market, will cost anywhere from $2 to $4.50 per bunch at a local grocery store or farmer’s market. This bunch will often be about five ounces or so. Loose non-organic spinach will retail for $3 to $5 per pound. A bag of spinach that is already washed and processed inside of a plastic bag can cost anywhere from $2 to $4 per eight ounces. 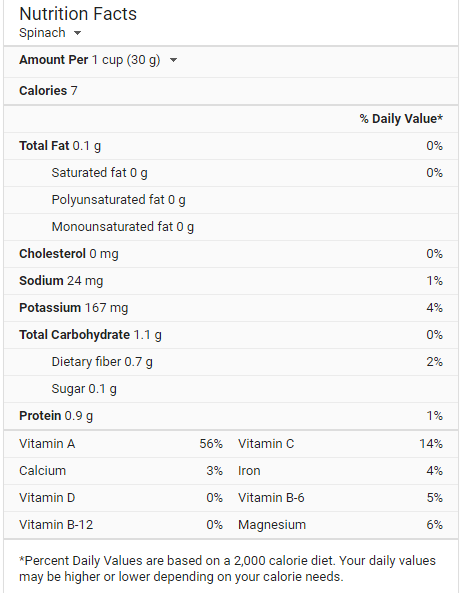 Organic spinach is often going to cost around $1 to $2 more. Spinach, aside from being fresh, can also come frozen and can be either whole or chopped. This type of spinach is best used when the spinach is being cooked or baked into something. Depending on the brand and quantity, an eight-ounce frozen box can cost $1 to $3. Trader Joe’s, for example, sells a six-ounce bag of organic baby spinach that retails for $2.50 per bag. At Walmart, its store-branded 10-ounce bag retails for close to $2. Spinach commonly found at a farmers market or grocery store will either be inside a plastic bag or plastic container with a snap-on lid. At some stores, it can be loose and you’re able to simply take what you want, similar to any other produce. If already processed, it will be labeled by the USDA as being organic and it should be pre-washed; however, it’s still advised you wash it at home for safety concerns. Three distinct types of spinach are often found at a local grocery store: Savoy, flat/smooth or semi-savoy. Savoy spinach is made up of leaves that are dark green and have a crinkly texture. This is the type of spinach that is most often sold fresh in grocery stores and markets. Flat or smooth-leafed spinach is much easy to clean because of its texture and is commonly made into the frozen variety of spinach. The last type of spinach is semi-savoy, which is simply a middle ground between the other two. It has leaves that are somewhat crinkly but is easier to clean like the smooth leafed spinach. Spinach is known to be the original superfood, packed full of beta-carotene and vitamins A, C and K.
The shelf life of spinach will depend on when you purchased it and how it’s properly stored. Fresh unopened spinach, as long as it’s refrigerated, will last close to seven days, whereas opened spinach will last closer to five days. 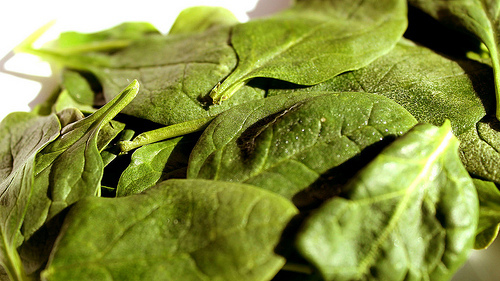 To know if spinach has gone bad, simply smell it. If it has gone bad, it will be darker in color and will have a stronger, unpleasant smell. To extend the life of spinach, refrigerate as soon as possible and keep it as dry as possible. It’s best to only wash the spinach you plan on consuming immediately. If buying spinach by the bag or frozen, look for coupons online. Many major brands have coupons available online and in store. Consider the store-branded spinach, again, if you buy in a bag or frozen. Farmers markets are often cheaper than purchasing at a local grocery store; plus, it’s going to be a lot fresher since you can go directly to the source, weeding out any middleman. Consider buying in bulk at local wholesale clubs such as Costco or Sam’s Club. For instance, at Sam’s Club, a 16-ounce plastic container can retail for about $4.